Having clean air inside your home is important to the health, safety, and well being of your family. 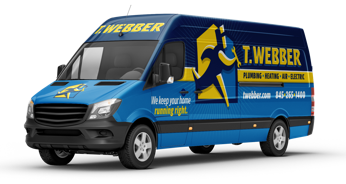 At T.Webber Plumbing, Heating, and Air Conditioning, we firmly believe that you deserve to always be comfortable in your home, and we’re going to help make that possible. Our team of experienced professionals has been assisting homeowners with air quality solutions for over 20 years, and we hope that you’re next! Humidifiers: Sick of that stuffy winter air cramping your style? If so, a whole house humidifier is exactly what you need. Humidifiers work to regulate and maintain moisture in the air in order to help improve comfort levels and protect household items – like wood furniture – from cracking. Ventilators: Ventilators blend indoor and outdoor air to find a temperature level that’s exactly right for you. UV lamps: Ultraviolet lamps are silent but effective. They help in destroying bacteria and mold, while also enhancing your air quality. Air cleaners: As their name suggests, air cleaners clean your air of dirt, dust, mold, mildew, and animal dander. No more breathing in all of those particles that float around your home. Which type of system would be best for your home depends on the needs you and your family have. Our experts can help you decide which one you might need, and can also install them right on the spot. Just need a repair on an existing system? Don’t worry – we can do that, too! For any and all air quality needs, call T.Webber Plumbing, Heating, & Air Conditioning today!